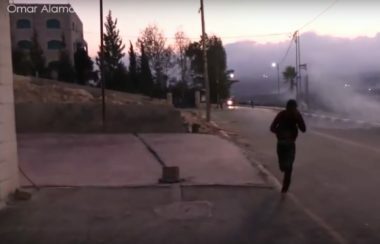 Israeli soldiers invaded, on Wednesday evening, Teqoua’ town, east of Bethlehem in the occupied West Bank, and injured several Palestinians, including a child. Media sources in Teqoua’ said several army jeeps invaded the town, and attacked a few Palestinian protesters by firing dozens of gas bombs from launchers mounted on their armored jeeps. They added that several Palestinians were injured, among a child and his family, due to the severe effects of teargas inhalation, after many gas bombs struck homes in the town. The soldiers invaded the town from many directions, and closed many roads, severely restricting the movement of the locals.